More than half a billion LTE capable phones in a feature phone form-factor will be shipped globally over the course of five years. Local kings (mobile phone brands) in many feature phone centric markets as well as Operators will look forward to drive this trend aggressively starting this year. 4G Feature phones shipments will grow more than 5300% this year. More than 400 million feature phones were sold globally in 2016 and we saw smartphone market growth slow down to 3% YoY, portraying that the easy days of smartphone growth are over. The smartphone growth slowing down and the feature phone decline slowing down is the polarization of market in terms of technology as well as user base. This is making a case for the rise of 4G capable feature phones with the core value proposition being VoLTE calls and move the users to the cost efficient 4G networks. We estimate more than half a billion 4G capable feature phones will be sold over the next five years, a ‘big short-term opportunity’ for players in the mobile industry. There are some 1.3 billion feature phone users out there, mostly from emerging markets of Asia and Africa. All these emerging markets are suffering from polarization of technology and economy. On one end, we are seeing rising growth of advanced 4G networks, 4G smartphones and data-centric 4G users. But on the other end we have 2G voice networks, 2G feature phones and 2G voice-centric users delaying upgrading to a 4G smartphone. 3G networks, smartphones, users risk being squeezed out of the market. The digital divide is also a function of a demographic divide where most of the 2G user base are refraining from upgrading to advanced 4G ecosystem due to issues including price, lack of literacy, lack of perceived need for the mobile internet and related applications, as well as a mind-blocking steep learning curve to upgrade to a 4G smartphone. For many voice calls and texts remain the king. 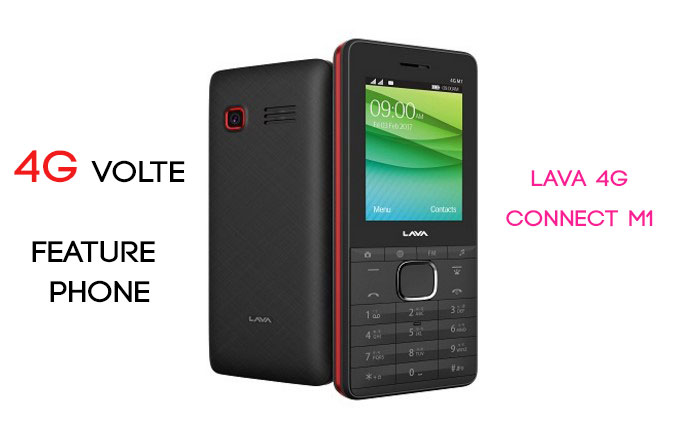 Thus, the advent of 4G capability in a feature phone form-factor primarily for low-power voice-centric users will at least leapfrog them to 4G networks. In markets, such as India, operators such as Reliance Jio are attracting lots of rural 2G users to its 4G network by offering free unlimited VoLTE calls. The 4G network is viewed as quite cost efficient with scale from cost per bit and spectral efficiency perspective. Operators want as many users from legacy generation to migrate to 4G quickly. Fast migration can help operators by driving cost savings and capacity utilization. It also frees up valuable lower frequency 2G spectrum for re-farming in to 4G or even future 5G networks. Once users are on 4G networks, even for voice (VoLTE) calls, operators have a better opportunity to cross-sell data plans and services that can support or enhance ARPU. 4G Feature Phones will be a good interim boost for operators to migrate users from 2G to 4G networks. This is also means new growth avenue for component vendors to drive 4G IP as well as other components to lower price points. In contrast, we believe this high growth segment would lead a race to the bottom in terms of pricing being in the most competitive/sensitive sub $50 segment. 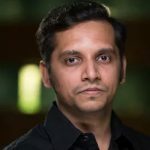 This will warrant for newer business models to drive revenue to help especially OEMs and Operators to make up for any lapse of the already thin margins on these devices – through content, app installs, services partnerships and so forth. As most of these 4G feature phones will sport a feature phone form-factor with absence of touchscreen and in many cases with no appstore to download apps, there will be opportunities to pre-install many apps and services (music, chat, social networks) which could leverage the Linux or forked AOSP running underneath as well as the 4G data network. We estimate close to 60 million units of 4G capable feature phones could ship this year globally from almost a million units last year with India potentially contributing to almost half of that this year. Close to 200 million 4G Feature phones to be potentially sold in India in next five years bridging the digital divide, an opportunity for OEMs as well as Operators. In the process, we could see the smartphone market growth might slow down a bit as the laggard feature phone users who eventually would have purchased a smartphone will delay the purchase for the 4G feature phone. Other markets which will be ripe for this segment would be Central Eastern Europe, Africa and parts of Asia. This opportunity though remains in sub US$50 segment and the lowest retail price point it could hit with scale and without subsidy is $25 over the next few years and with subsidy could go to as low as US$15 or free in some markets. In terms of hardware revenues, it’s a US$16 billion global opportunity cumulatively over the next five years. Key players to watch out in this segment are Micromax, itel, Lava, Jio, Nokia, True, ZTE and so forth. Chipset brands such as Qualcomm with its latest Qualcomm 205 platform specially designed for 4G LTE Feature Phones is poised to drive growth starting end of Q2 2017. Spreadtrum should follow soon, driving prices down further. 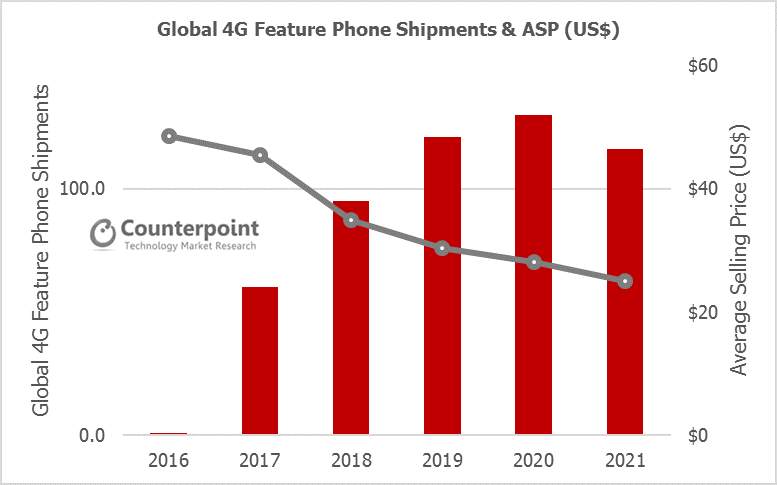 Exhibit: Global 4G Feature Phone & ASP Forecast Trends.